Delectable food, high energy dance floor, and emotional toasts make for a delightful party, but most importantly before you can reach any of that, you need to arrive at the party preferably on time. For your wedding day, transportation mess ups can start your day off awkward and stressful. No bride or groom needs to be anxious or stressed out pushing back the festivities and leaving their guests feeling cranky. Denver Limo, Inc. knows how to work with weddings and our wedding limo service in Denver ensures that you have a fun, smooth and prompt ride. Denver Limo, Inc. offers luxurious wedding limo services in Denver. With our fleet of stretch limousines, super-extend limos, and extravagance cars, we can fulfill any wedding transportation requirement you may have. We work straightforwardly with every marriage customer to guarantee that consideration is given to everything about it goes to their wedding transportation service. Call us today to find out more details about what we can do to make your wedding day even more special! From transportation to your honeymoon hotel, destination, or airport, to convenient airport service for out-of-town guests and post-reception shuttles, tailoring our wedding limo service to your dream is our priority. Initiate a reservation online or contact us today to learn more! Book Us Way In Advance----After you have settled on your wedding date, reception and ceremony sites, and wedding party size; start talking to us about six months out from your date. If you're getting married during most limousine company's graduation and prom season- April, May or June- know that most formal vehicles will be a greater want especially for weddings. It is important to book our Denver wedding limousine service even earlier (9 months earlier is better if in specific season). Think Beyond the Limo----A standard limousine dependably works for a conventional wedding, yet in the event that that is not your style, get innovative and coordinate your ride to your wedding style and taste . There are loads of alternatives for wedding vehicles just ask! Give Your Attendants a Ride----Despite the fact that your wedding party is in charge of covering their own movement to the site, help them out and treat them to transportation on your special wedding day. In case you're not making a trip with them, give a different vehicle to them to get to the scene. At that point toward the finish of the night, after you two have snuck off, the gathering can heap into a visitor carry home or back to the lodging. Book the Reservation in Person----Have you at any point booked a rental vehicle on the web and been frustrated by the ride you actually got? Try not to give this a chance to occur on your wedding day. It is important to look at reviews, talk on the phone and make your last reservation face to face. You'll have the capacity to get a glance at the vehicle you'll be riding in (or possibly a fundamentally the same as one). Therefore you can maintain a strategic distance from any unwelcome amazement by ensuring the fleet looks fit as a fiddle before you accidentally settle for something that is not just right. Cushion Every Trip by 20 to 30 Minutes----Being late due to everyday traffic can completely mess up a normal day, and it can truly put a damper on your wedding. Cushion some additional time onto each trek you'll be presenting in defense of unwanted delays, and remember that getting energized individuals in tulle skirts into different vehicles is no simple accomplishment. On the off chance that you need to be additional careful, take a test turn of each course in the meantime and day of the seven day stretch of your wedding to use as your guide. Research any sporadic happenings about town on your wedding day that may cause intrusions and include additional movement time. Plan to Pay for Wait Time----Most wedding limousine services in Denver charge by the hour and require a base booking, commonly three hours. By and large, this implies you'll contract them for the entire day. In any case, compute the extra hours required, from the ceremony pickup to the finish of the reception, to decide if it's justified, despite all the trouble to pay for the pause. (We tend to think it is, if just to spare you from worrying about another detail amid your bustling day.) Expect to pay approx. $50 and $150 every hour, in addition to a 20 percent tip, which is typically incorporated into the agreement (deals assessment may likewise be charged). Be Specific---Wedding transportation should be luxurious. Unique solicitations, similar to the sort of champagne you need close by, a specific kind of music player you require (like an AUX rope) or a particular clothing standard for the driver, can for the most part be suited. Simply get some information about including these specifics into your agreement before you sign. Get some information about Decorations---Numerous wedding limousine services don't allow stylistic layout on their vehicles (particularly the vintage assortment). 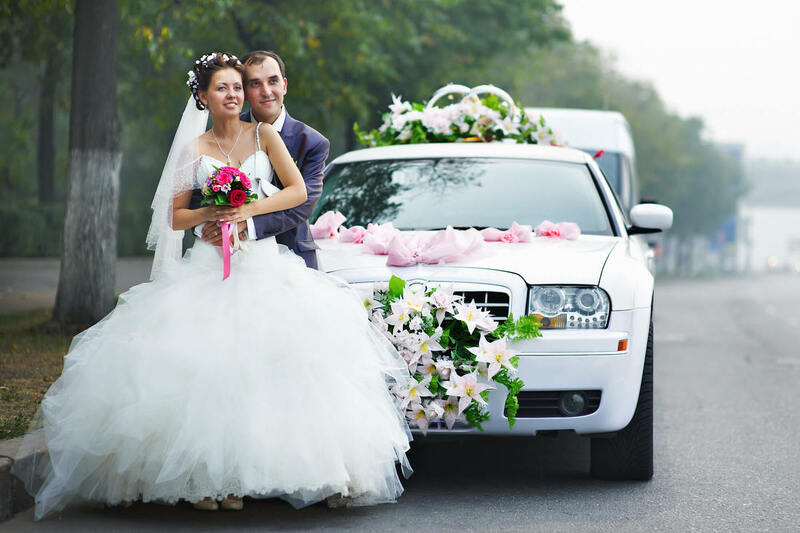 So before you get connected to the possibility of a decked-out wedding escape vehicle for that exemplary photograph, get some information about it. The organizations that do permit it might expect you to take the trimmings off for well being reasons when you drive outside of anyone's ability to see. In the event that you need the full impact—jars, streamers, signs and blooms—you may be want to talk to us about what we can allow. Make Day-Of Playlists---You don't need to ride to the wedding in silence and only hearing the beating of your heart—now's an ideal opportunity to get in the inclination. Make a couple of playlists of your main tunes for your treks to the ceremony, reception and home toward the finish of the night. In case you're contracting transports for your visitors, make playlists for their rides as well.